Delta Optical Thin Film A/S is a global manufacturer of optical thin film coatings with over 50 years experience. Delta pioneered optical monitoring techniques for deposition control in the 1960s. Delta Optical ensures a quick and effective design process with its advanced and unique optimization software to match the customer’s optical specifications. DELTA offers a series of filter sets designed for fluorescence applications. The filters are split into two series - value sets with good blocking, transmission and optical performance, and TopPride™ sets with additional performance benefits for demanding situations. The filter sets are available in sets or as an excitation filter, dichroic or an emission filter for separate combinations. Ultra-hard-coated filters on single substrate construction. No colored glass (minimal lens effect, extreme durability and minimal auto fluorescence). Scratch/Dig optical surface specifications 60/40. Typical transmission level of 95-98% (minimum 92%). The upper limit of the blocking range is beyond 950 nm to better suit modern camera based microscopes. 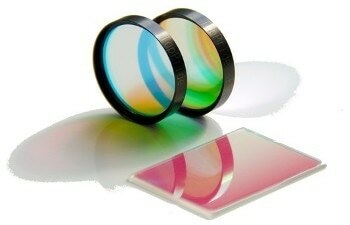 Delta Optical Thin Film has a range of bandpass filters that include broadband, narrow band, laser line and TopPride™. Available filter wavelengths range from 362 nm to 788 nm. Standard dimension is ∅25 mm (with ring) - other dimensions on request. The data sheets show typical transmission curves for unpolarized light and an AOI=0°. Delta Optical Thin Film A/S is a global manufacturer of optical thin film coatings with over 50 years of experience. Optical monitoring techniques were pioneered by Delta to control deposition in the 1960s. With its innovative and sophisticated optimization software to match the optical specifications of customers a fast and efficient design process is ensured by Delta.